Born to Boogie is a studio album by American country music artist Hank Williams, Jr. It was released by Warner Bros. Records in July 1987. The title track, "Heaven Can't Be Found" and "Young Country" were released as singles. The album reached #1 on the Top Country Albums chart and has been certified Platinum by the RIAA. Born to Boogie also won the Country Music Association Album of the Year award in 1988. Randall Hank Williams (born May 26, 1949), better known as Hank Williams, Jr., is an American country singer-songwriter and musician. His musical style is often considered a blend of Southern Rock, blues, and traditional country. He is the son of country music pioneer Hank Williams, and the father of Hank Williams III, Holly Williams, Hilary Williams, Samuel Williams and Katie Williams. Sam is expected to start recording officially in 2010. Williams began his career imitating his famed father. His style gradually evolved, until he was involved in a near fatal fall off the side of a mountain, which apparently changed his personal and professional life. After an extended recovery, he challenged the country music establishment with a blend of country, rock, and blues. After some success in the 1980s, Williams earned considerable recognition and popularity. He is now considered an elder statesman of the country and outlaw country genres. As a multi-instrumentalist, Williams' repertoire of skills include guitar, bass guitar, upright bass, steel guitar, banjo, Dobro, piano, keyboards, harmonica, fiddle, and drums. Williams was born in Shreveport, Louisiana. His father nicknamed him Bocephus (after Grand Ole Opry comedian Rod Brasfield's ventriloquist dummy). After his father's untimely death in 1953, he was raised by his mother Audrey Williams. While he was a child, a vast number of contemporary musicians visited his family, who influenced and taught him various music instruments and styles. Among these figures of influence were Johnny Cash, Fats Domino, Earl Scruggs and Jerry Lee Lewis. He first stepped on the stage and sang his father's songs when he was eight years old. In 1963, he made his recording debut with "Long Gone Lonesome Blues", one of many of his father's classic songs. Williams' early career was guided, and to an extent some observers say outright dominated, by his mother, who is widely claimed as having been the driving force that led his father to musical superstardom during the late 1940s and early 1950s. Audrey, in many ways, promoted young Hank Jr. as a Hank Williams impersonator, even to the extent of having stage clothes designed for him that were identical to his father's, and encouraging vocal styles very similar to those of his father's. Although Williams' recordings earned him numerous country hits throughout the 1960s and early 1970s with his role as a "Hank Williams clone", he became disillusioned and severed ties with his mother in order to pursue his own musical direction and tastes. After recording the soundtrack to Your Cheatin' Heart, a biography of his father, he hit the charts with one of his own compositions, "Standing in the Shadows (Of a Very Famous Man)". The song signalled a move to rock and roll and other influences, as he tentatively began to step out of the titular shadow of his father. Furthermore, during this time, Williams had his first two No. 1 songs: "All For the Love of Sunshine" (1970, featured on the soundtrack to Kelly's Heroes) and "Eleven Roses" (1972). By the mid-1970s, Williams began to pursue musical direction that would, eventually, make him a superstar. Nevertheless, while recording a series of moderately successful songs, Williams began a heavy pattern of both drug and alcohol abuse.Upon moving to Alabama, in an attempt to re-focus both his creative energy and his troubled personal life, Williams began playing music with Southern rock musicians, among them Waylon Jennings, Toy Caldwell, Marshall Tucker Band and Charlie Daniels. Hank Williams Jr. and Friends, often considered his "watershed" album, was the product of these then-groundbreaking collaborations. Just as his career was starting to see a revival, tragedy befell Hank Williams, Jr. once again. While he was climbing Ajax Mountain in Montana on August 8, 1975, he fell 442 feet down the side of the mountain. His injuries were serious—his skull was split and his face was crushed—but he survived. Following extensive reconstructive and cosmetic surgery, he had to learn how to speak and sing all over again. Williams' recovery period lasted at least two years.. After two years of surgery and recovery, Williams returned to the studio releasing two albums. In 1977 Williams released One Night Stands. It was the New South album which he got to work with his old friend Waylon Jennings. Waylon produced the album and appeared with vocals on Once and For All. Williams' career began to hit its peak after the Nashville establishment gradually—and somewhat reluctantly—accepted his new sound. His popularity had risen to levels where he could no longer be overlooked for major industry awards. He was extremely prolific throughout the 1980s, sometimes recording and releasing two albums a year. Family Tradition, Whiskey Bent and Hell Bound, Habits Old and New, Rowdy, The Pressure Is On, High Notes, Strong Stuff, Man of Steel, Major Moves, Five-O, Montana Cafe, and many others resulted in a long string of hits. In 1987 and 1988, Williams was named Entertainer Of The Year by the Country Music Association. In 1987, 1988, and 1989, he won the same award from the Academy of Country Music. The pinnacle album of his acceptance and popularity was Born to Boogie. During the 1980s, Williams became a country music superstar known for catchy anthems and hard-edged rock-influenced country. During the late 1970s and into the early to mid 1980s Hank Jr's songs constantly flew into the number one or number two spot. His songs like "Family Tradition", "Whiskey Bent and Hell Bound", "Old Habits", "Ain't Misbehavin'", "Born to Boogie", and "My Name is Bocephus". [clarification needed] The 1987 hit single Wild Streak was co-written by Houston native Terri Sharp, for which Williams and Sharp both earned gold records. His 1989 hit "There's a Tear in My Beer" was a duet with his father created using electronic merging technology. The song itself was written by his father, and had been previously recorded with Hank Williams playing the guitar as the sole instrument. 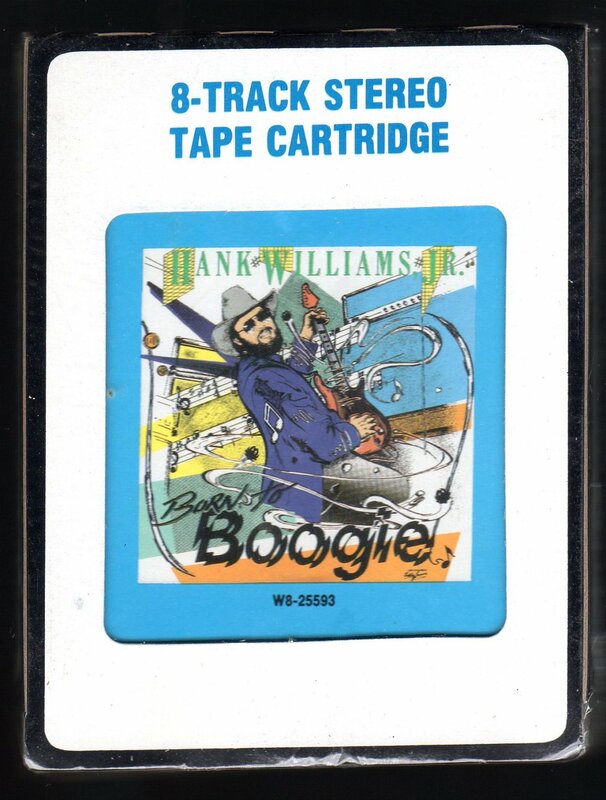 The music video for the song combined television footage that had existed of Hank Williams performing, onto which electronic merging technology impressed the recordings of Hank Jr., which then made it appear as if he were actually playing with his father. The video was both a critical and commercial success. It was named Video Of The Year by both the Country Music Association and the Academy of Country music. Hank Williams, Jr. would go on to win a Grammy award in 1990 for Best Country Vocal Collaboration. He is probably best known today for his hit "A Country Boy Can Survive". He may also be well known today as the performer of the theme song for Monday Night Football, based on his 1984 hit "All My Rowdy Friends Are Coming Over Tonight". The opening theme became a classic, as much a part of the show as the football itself. In 1991, 1992, 1993, and 1994, Williams' opening themes for Monday Night Football earned him four Emmy awards. In 2001 Hank rewrote his classic hit "A Country Boy Can Survive" after 9/11, renaming it "America Can Survive". In 2004, Williams was featured prominently on CMT Outlaws. And in 2006 Williams starred at the Summerfest concert. He has also made a cameo appearance along with Larry the Cable Guy, Kid Rock, and Charlie Daniels in Gretchen Wilson's music video for the song "All Jacked Up". He and Kid Rock also appeared in Gretchen Wilson's "Redneck Woman" video. Hank is also in a small part of Kid Rock's video "Only God Knows Why". He is also name-checked or referenced in numerous songs by modern-day country singers, including Kid Rock, Gretchen Wilson, Alan Jackson, Justin Moore, and Trace Adkins. In April 2009, Williams released a new single, "Red, White & Pink-Slip Blues", which charted to #43 on the country charts. The song was the lead-off single to Williams' album, 127 Rose Avenue. The album debuted and peaked at #7 on the Billboard Top Country Albums chart. Also in July 2009, it was announced that 127 Rose Avenue would be his last album for Curb Records.